Book 3 and 4 is available !! All three of us were missing a book that allows us to record step by step instructions for patterns and a place to practice. We love tangling, however individual tiles are easily lost. 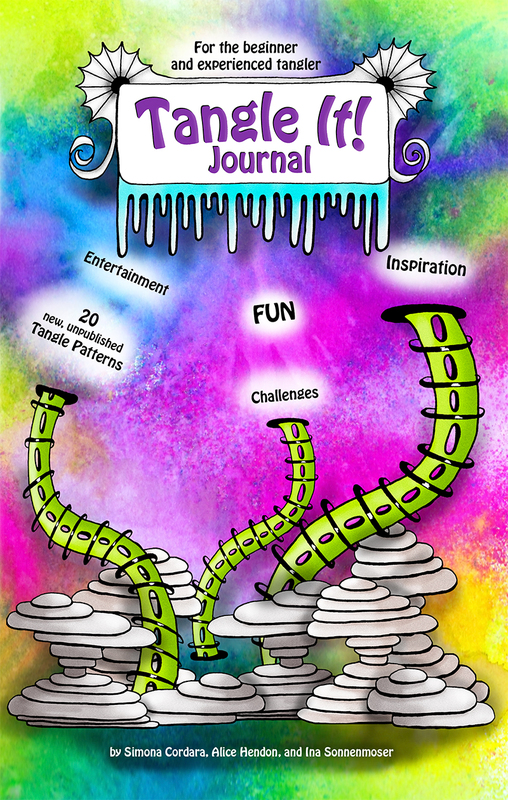 When we realized that each of us use a journal to organize, practice, and store tiles, we decided to create “the perfect book for tanglers”. A place where we have it all: record step outs AND lots of room to tangle. Our combined experience produced this lovely Practice Book. We included a basic introduction to tangling, shading, and creating strings, plus a few interesting topics to inspire you. 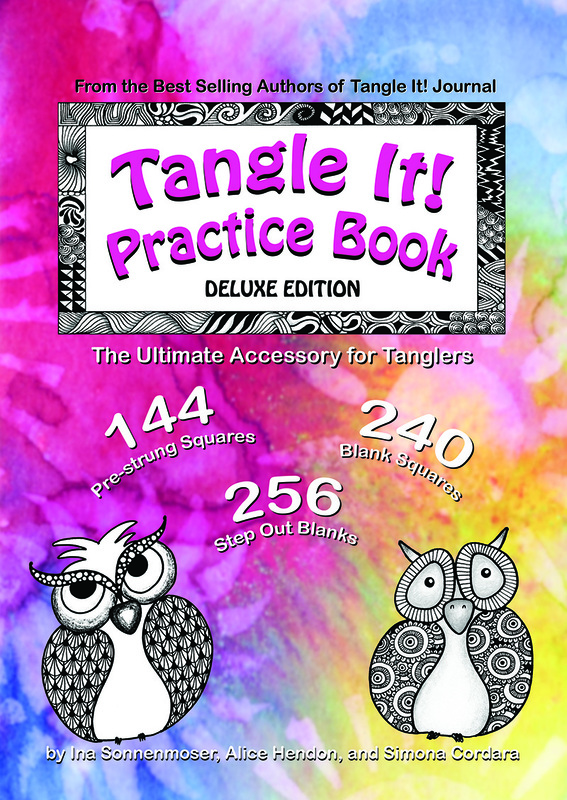 The Ultimate Accessory for Tanglers – All organized in one great little practice book! This book is available in 2 versions: black& white and full color. We highly recommend the color version. The paper quality is thicker and it is just so much more fun to have a bit of color in your life! The Deluxe Edition on the right is in full color and the paper is thicker. The Black & White Editions contains only Black and White pages. Finally I have it in my hands! Now THIS is a seriously sized book – definitely value for money! It is thick .. and heavy .. and beautiful! I took a few photos of my bookshelf. Most of you have the one or other book. Here you can see just how massive a 270 page book is! What I like most about it is, that you can really start at any time of the year. The pattern index at the back of the book comes in very handy. How often do you think: “hmmm, what pattern could I add here”? This index featuring all 101 NEW patterns is just what I needed. And looking at the bright colors on the cover just make me happy. This will be THE book on my desk! Amazon.com is offering a 25% discount at the moment when you enter the code 25OFFBOOK during checkout. I am not sure how long that will last, but that brings the price of the book down to just over $20. Considering how much you pay for any other planner that does NOT contain 101 new patterns, I think it’s a bargain. 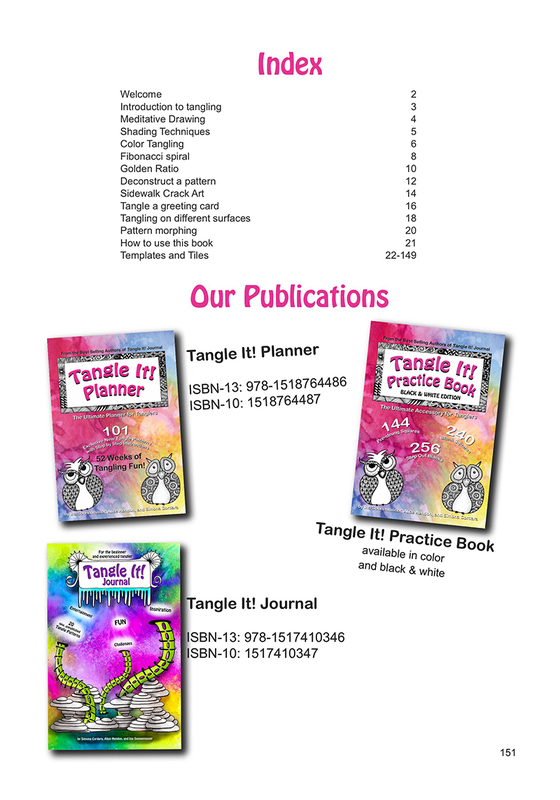 Oh, I forgot to mention that the 101 new patterns do NOT include the 20 patterns introduced in our Tangle It! Journal. Many of you have heard of Geneviève Crabe. The Weekly Roundup is a must-read for tanglers! What really caught my attention were the beautiful Mandala templates Geneviève so generously provides on her webpage. Click here to have a look. She combined all of them into a book which is now available on Amazon. 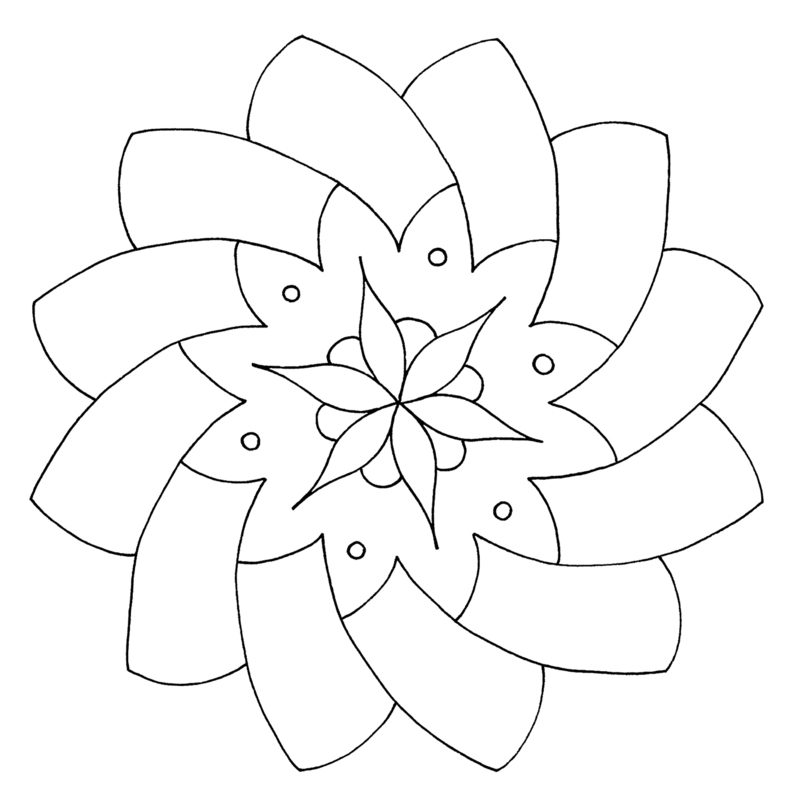 40 printed Mandalas ready for coloring for US$12 – that is a bargain! For 33c per page you can’t complain about the price! And then I discovered the link to the Mandala Stencils! It took a while to ship to Germany, but the wait was well worth it. The parcel arrived professionally packed to avoid that the stencils get damaged during transport. 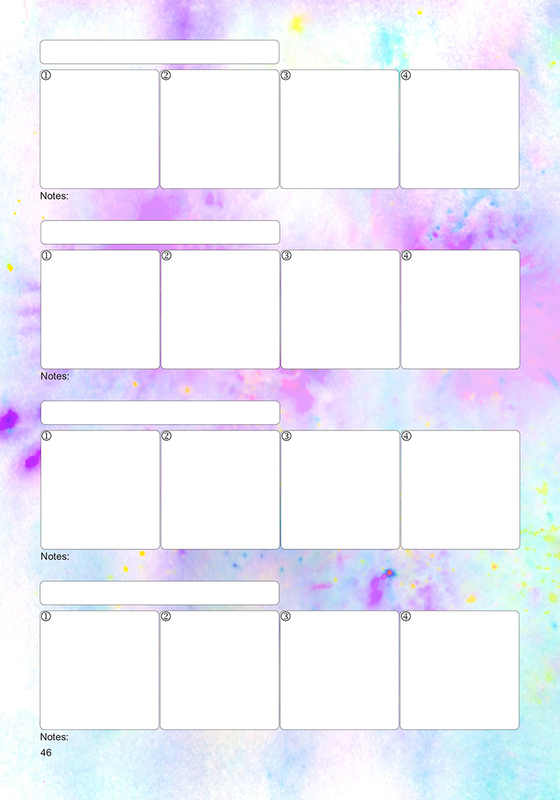 A 2 page intro is included guiding you to video instructions. The 3 stencils are labeled for easy reference. The see-through plastic is thicker than a laminated sheet, robust and easy to clean. The holes are perfectly punched and just the right size to fit a pencil or fineliner tip through. I have created Mandalas before and got very impatient with the whole process. By the time I drew circles and lines to get evenly spaced points, my creative juices were usually already moving on to the next project. And even after I finished a Mandala design, I had to rub out all the pencil lines, smudging lines and crumbling up the paper in the process. With this stencil set I was able to draw this Mandala template for tangling in a few minutes. Thank you, Geneviève. 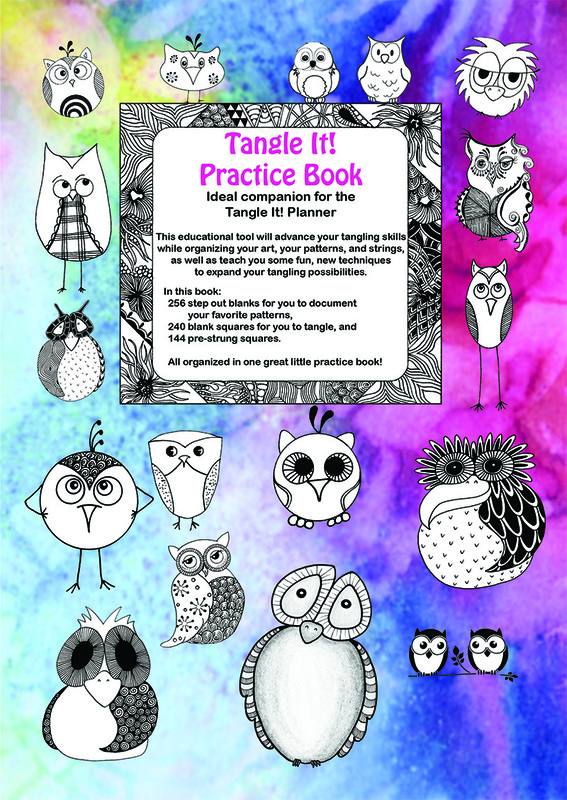 The Tangle It Mandala Club on Facebook will see many new templates ready for tangling or coloring in the future! I can only highly recommend this stencil set to any Mandala designer! I have purchased all of Helen’s e-Books. They are fantastic! Of course I had to get this one straight away. The title sounded already very intriguing. 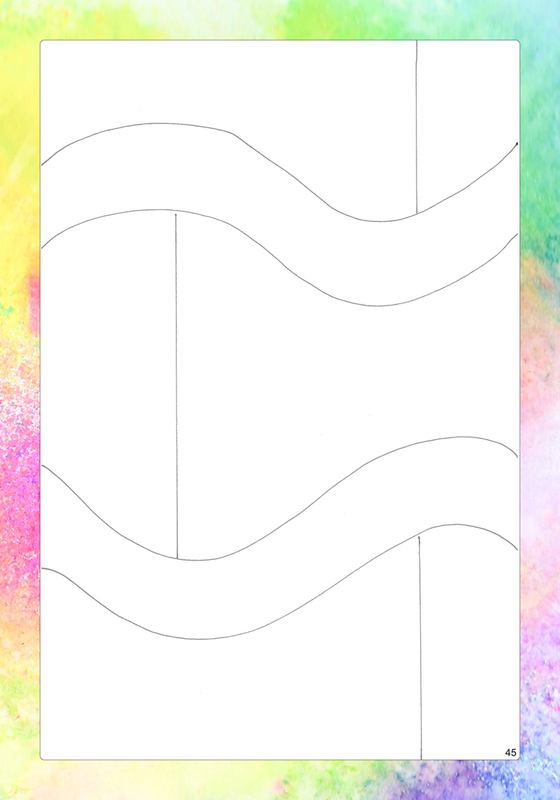 Tangle Transformations – how to transform a pattern. Judging from Helen’s artwork, this book promised to be very interesting. Helen breaks down patterns into structures. Amazingly it matches my thought process completely. What is the basic architecture behind a pattern? 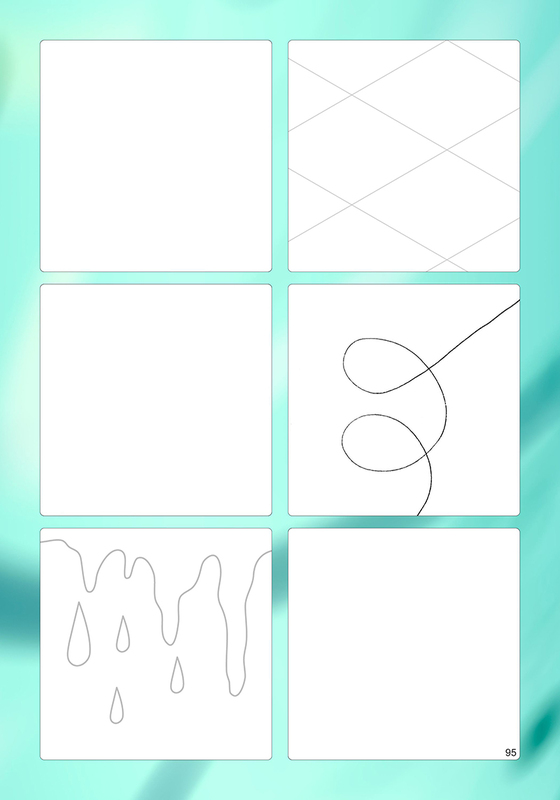 A dot grid, a square grid, lines? The book describes in detail the differences. Helen made it easy to understand by providing graphical examples. Based on their architecture, Helen explains the various possibilities of transforming patterns. You will soon get the idea, that this can be applied to any pattern. My curiosity was triggered immediately and I had to grab pen and paper to apply those principles to a variety of patterns. Of course, the artwork included in this e-Book is outstanding. You can zoom in without any eyesores. I am very particular when it comes to line work: Lines going over the edge, lines not meeting up – but of course, Helen’s work is the work of a perfectionist. Helen’s style is unique and following her tips, guarantees great results. Her way of thinking when it comes to patterns matches mine 100%. The book I am currently writing will go so well with this e-Book. 55 pages of detailed information awaits you. I can only recommend this e-Book to everyone. It will provide you with a whole new perspective on patterns!